Introduction: The skin stage of malaria is a vital and vulnerable migratory life stage of the parasite. It has been characterised in rodent models, but remains wholly uninvestigated for human malaria parasites. To enable in depth analysis of not genetically modified (non-GMO) Plasmodium falciparum (Pf) sporozoite behaviour in human skin, we devised a labelling technology (Cy5M2, targeting the sporozoite mitochondrion) that supports tracking of individual non-GMO sporozoites in human skin. Methods: Sporozoite labelling with Cy5M2 was performed in vitro as well as via the feed of infected Anopheles mosquitos. 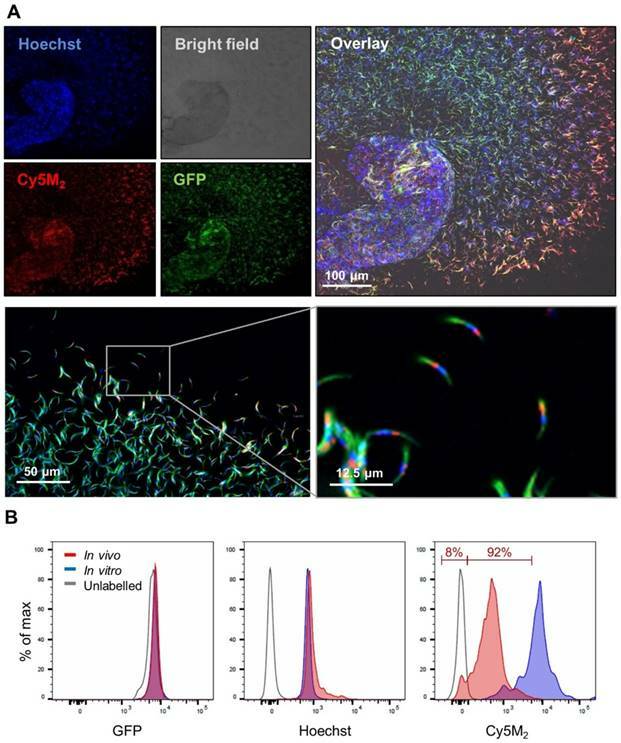 Labelling was validated using confocal microscopy and flow cytometry and the fitness of labelled sporozoites was determined by analysis of infectivity to human hepatocytes in vitro, and in vivo in a rodent infection model. Using confocal video microscopy and custom software, single-sporozoite tracking studies in human skin-explants were performed. Results: Both in vitro and in mosquito labelling strategies yielded brightly fluorescent sporozoites of three different Plasmodium species. Cy5M2 uptake colocalized with MitoTracker® green and could be blocked using the known Translocator protein (TSPO)-inhibitor PK11195. This method supported the visualization and subsequent quantitative analysis of the migration patterns of individual non-GMO Pf sporozoites in human skin and did not affect the fitness of sporozoites. Conclusions: The ability to label and image non-GMO Plasmodium sporozoites provides the basis for detailed studies on the human skin stage of malaria with potential for in vivo translation. As such, it is an important tool for development of vaccines based on attenuated sporozoites and their route of administration. Despite global control efforts, malaria remains the most deadly parasitic disease worldwide accounting for 435.000 deaths in 2017 alone , particularly among children below 5 years of age in Sub-Saharan Africa. Decades of research into malaria vaccine development has led to a focus on immune recognition of the clinically silent pre-erythrocytic stage of Plasmodium parasites, i.e. sporozoites injected by an infected mosquito that infect liver cells. At this stage, the number of parasites is still low (~100 sporozoites are injected per mosquito bite ) and during their migration from the skin inoculation site to the liver the extracellular sporozoites are vulnerable to attack by immunoglobulins [3, 4]. Ultimately, only around a quarter of injected sporozoites will make their way from the injection site to the liver, leaving the majority behind in the skin . Pre-erythrocytic immunity to malaria can be induced by repeated exposure to attenuated Plasmodium falciparum (Pf) sporozoites that arrest development in the liver . Remarkably, these sporozoites induce a strong protective immune response when delivered by the bite of Pf infected mosquitoes [2, 6] or following intravenous (IV) administration of purified attenuated Pf parasites [7, 8] , but intradermal (ID) syringe injection of the latter yields inferior protective immunity both in human and in rodent models of malaria [7, 9, 10]. However, the use of live mosquitoes or IV administration for large scale vaccination in sub-Saharan countries is not practical. To rationally design a highly potent malaria vaccine that helps trigger immunity at the pre-erythrocytic stage, more insight into the skin-liver migration mechanisms and immune priming by sporozoites is urgently needed. In rodents, genetically engineered murine Plasmodium parasites expressing reporter proteins such as green fluorescent protein (GFP) or luciferase provided unprecedented insight into host-to-host parasite transmission and subsequent migratory behaviour of sporozoites from skin to liver. With the use of such tools, sporozoite motility in the skin was visualized [11-13] and the initial dermal immunological responses to injected parasites could be characterized [14, 15]. The clinical translation of these rodent malaria characteristics poses some challenges: 1) the difference between rodent and human skin in anatomy and the population of skin-resident immune cells makes it difficult to translate rodent data to humans, and 2) application of transgenic reporter parasites in humans is undesirable. As a consequence, there is demand for imaging technologies that support tracking of single not genetically modified (non-GMO) Pf sporozoites in human skin. Molecular imaging provides a means to monitor the location of pathology in vivo . While this technology is most advanced in oncological settings, it also proved to be of value for the detection of infectious diseases, particularly in bacterial infections . Uniquely, many imaging modalities and targets in biomedical imaging are universal. Exogenous fluorescent tracers are not only standard tools in biomedical in vitro assays, but are also increasingly clinically employed to provide high resolution real-time guidance during interventions e.g. for skin cancers . Based on these utilities, we reasoned fluorescent tracers could also be used to track non-GMO sporozoites in human skin. We investigated the receptor specific uptake of the mitochondrial Cy5-methyl-methyl (Cy5M2) tracer. Based on the chemical properties of Cy5M2: lipophilicity and charge, as well as structure, we hypothesized that translocator proteins (TSPO), formally known as the peripheral-type benzodiazepine receptor (PBR), at the outer mitochondrial membrane [19, 20] could be a potential target of this tracer. We demonstrate Cy5M2 mitochondrial labelling capacity of sporozoites which can be blocked by the known TSPO inhibitor PK11195 . Cy5M2 enables labelling of multiple Plasmodium species, both in vitro and in the mosquito host. Additionally, we studied the cell-tracking utility of Cy5M2-labelled Pf sporozoites in a human skin explant model. As a proof of concept for their future use, the fitness of Cy5M2-labelled sporozoites was studied in an in vitro human hepatocyte infection assay as well as in vivo in a rodent infection model. Sporozoites were obtained from two rodent malaria species Plasmodium berghei (Pb) and Plasmodium yoelli (Py). We used the following wild type and transgenic lines that express fluorescent and/or luminescent reporter proteins: Wild type Pb ANKA (cl15cy1 ); Pb line 1868cl1 expressing mCherry and luciferase under the constitutive HSP70 and eef1a promotors respectively  (RMgm-1320, www.pberghei.eu) Pb line Bergreen , Wild type Py 17XNL (RMgm-688, www.pberghei.eu ); Py line 1971cl1  expressing green fluorescent protein (GFP) and luciferase under the constitutive eef1a promoter (RMgm-689, www.pberghei.eu). Mosquitoes were infected by feeding on infected mice as described previously . For all experiments we used female Swiss mice (6-7 weeks old; Charles River, Leiden, The Netherlands). In addition, sporozoites were obtained from the human parasite Pf (NF54 , kindly provided by Radboudumc, Nijmegen, The Netherlands). Mosquitoes were infected by standard membrane feeding as previously described . All animal experiments of this study were approved by the Animal Experiments Committee of the Leiden University Medical Center (DEC 14307). The Dutch Experiments on Animal Act is established under European guidelines (EU directive no. 86/609/EEC regarding the Protection of Animals used for Experimental and Other Scientific Purposes). All experiments were performed in accordance with relevant guidelines and regulations. Salivary glands from infected mosquitoes were dissected manually at day 14-21 (Py and Pf) or day 21-28 post infection (Pb). Glands were incubated in RPMI 1640 (Invitrogen, Carlsbad, CA, USA) supplemented with 10% heat inactivated Fetal Calf Serum (FCS; Bodinco, Alkmaar, The Netherlands) containing 2.6µM Cy5-methyl-methyl (Cy5M2; 1ug/ml; for compound details see supporting information; Fig. S1) or, 100nM MitoTracker® Green for 30 minutes at 28°C or mock stained using RPMI 10% FCS only. TSPO blocking experiments were performed by incubating sporozoites with the known TSPO inhibitor PK11195  (50 µM; 40 minutes at 37˚C; see supporting information) before the incubation with Cy5M2. Subsequently, salivary glands were washed twice in RPMI 10% FCS and either imaged directly, or homogenized and filtered over a 40µm filter (Falcon, Corning, Amsterdam, The Netherlands). The whole salivary gland, or solution containing sporozoites was pipetted onto a microscopy slide for live imaging using either a confocal (Leica TCS SP8, Wetzlar, Germany, 40x objective) or a conventional fluorescence microscope (Leica AF6000LX, Wetzlar, Germany, 40x objective). Nuclei were counterstained with Hoechst 33342 10 minutes before imaging. Mosquitoes were infected either with wild type (WT) or transgenic Pb or Py. In addition, mosquitoes were infected with WT Pf as previously described . Infected mosquitoes were fed on fresh whole blood or 5% glucose in water containing 26µM Cy5M2 (10µg/ml) at day 21-28 (Pb) or day 14-21 post infection (Py and Pf). Feeding was performed using water-heated, glass mosquito feeders at 39°C as previously described , in an interrupted feeding schedule of five times two minutes. To maximize feeding behaviour, we withheld glucose 24 hours prior to feeding. Immediately after feeding, salivary glands of fed mosquitoes were dissected and placed on a microscopy slide for imaging. Nuclei were counterstained in vitro using Hoechst 33342. Slides were imaged using a Leica TCS SP8 confocal microscope with a 40x objective. Salivary glands containing GFP expressing Pb (Bergreen) sporozoites were labelled with Cy5M2 using either the in vitro or the in vivo labelling technique (see above) or mock stained in vitro. Glands were homogenized, stained with Hoechst 33342 in vitro, and resuspended in FACS (Flow Cytometric Cell Sorting) buffer (Phosphate-buffered saline (PBS; Braun, Melsungen, Germany) containing 2mM Ultra pure EDTA (Invitrogen, Carlsbad CA, USA) and 0.5% Bovine serum albumin; BSA (Roche, Basel, Switzerland)). Samples were measured by LSR FortessaTM (BD Bioscience, Franklin Lakes, NJ, USA) and analysed in FlowJoTM version 9.9.5 (FlowJo LLC, Ashland, OR, USA). Sporozoites were selected by gating on GFP-positive events and Cy5M2 fluorescence signal was quantified in Median Fluorescent Intensity (MFI). Events were normalized to FlowJo algorithms (% of max) to account for the differences in numbers of sporozoites measured per sample. Sporozoite fitness after labelling was established by measuring in vitro infection of hepatocytes and development within hepatocytes as described previously . In brief, 5x104 Pb sporozoites of line 1868cl1 expressing mCherry were stained in vitro with Cy5M2 or mock stained as described above. Sporozoites were incubated with cells of a HUH7 human hepatoma cell line in a 1:1 ratio in RPMI 10% FCS at 37 degrees for 44 hours. Hepatoma nuclei were stained using Hoechst 33342. Live imaging of liver stage parasite development (presence of liver schizonts) was performed using a conventional fluorescent microscope (Leica AF6000LX). In addition, infectivity was quantified by real-time PCR. DNA was isolated from infected cells 4 hours post infection using a QIAamp DNA Mini Kit (Qiagen, Hilden, Germany) and a real-time PCR was performed as previously described using a cross-species 18S gene based cross species Plasmodium probe . Sporozoite fitness after labelling was established by measuring parasite liver loads in vivo after infection of mice with labelled parasites. Whole salivary glands of mosquitoes infected with Pb line 1868cl1 were collected in RPMI medium and stained with Cy5M2 in vitro or mock stained in medium as described above. Sporozoites were isolated as described above (section In vitro Cy5M2 labelling of sporozoites). The free sporozoites were counted in a Bürker counting chamber using phase-contrast microscopy. A total number of 5x104 sporozoites was administered to mice by ID injection of 10 µl at both upper thighs using a 30G x 8 mm needle (BD Micro-Fine, BD Biosciences, Breda, The Netherlands). Prior to administration of sporozoites, mice were anesthetized using the isofluorane-anesthesia system (XGI-8, Caliper Life Sciences, Waltham, MA, USA) and shaved in order to optimize the precision of administration. Parasite liver loads were determined in live mice at 44 hours post infection by real time in vivo imaging of luciferase-expressing liver stages as previously described . Liver stages were visualized by measuring luciferase activity of parasites in whole bodies of anesthetized mice using the IVIS Lumina II Imaging System (Perkin Elmer Life Sciences, Waltham, MA, USA). D-luciferin was dissolved in PBS (100 mg/kg; Caliper Life Sciences) and injected subcutaneously in the neck. Animals were kept anesthetized during the measurements, which were performed within 8 minutes after the injection of D-luciferin. Quantitative analysis of bioluminescence of whole bodies was performed by measuring the luminescence signal intensity using the ROI (region of interest) settings of the Living Image® 4.4 software (Perkin Elmer Life Sciences). Presence of blood parasitaemia and prepatent period was determined by Giemsa-stained blood smear at day 4 to 10 post sporozoite infection. The prepatent period (measured in days post sporozoite infection; prepatency) ends at the day that blood stage infection with 0.5-2% parasitaemia is observed. Human skin explants were obtained from patients undergoing abdominal reduction surgery (CME approval number: B18-009). Immediately after surgery, skin explants were injected intradermally with 106 in vitro Cy5M2-labelled Pf sporozoites. Sporozoites were mixed with Yellow-Green fluorescent 500nm Latex nanoparticles (Sigma Aldrich) in order to locate the injection site microscopically. A 6mm punch biopsy was taken at the injection site. Biopsies were sliced longitudinally through the injection site and mounted on a microscopy slide with a 1 mm depression in RPMI 10% FCS. Slides were imaged for 30-60 consecutive minutes using a Leica TSC SP8 Confocal microscope with accompanying Leica LASX software, using an exposure time of approximately 1.7 seconds per frame and a 40x objective. Recorded microscopy movies were analysed for sporozoite motility, using a custom MATLAB software (The MathWorks Inc. Natick, MA, USA) termed SMOOThuman skin. In this application tailored software package, sporozoite locations were segmented per movie frame, based on both fluorescence intensity and shape. To reconstruct sporozoite movement over time, median pixel locations per segmented sporozoite shape were connected in time, based on both pixel and frame locations. Based on the dynamic behaviour of the sporozoites it was possible to i.a. isolate the following features: migration pattern, speed and parameters of track tortuosity (see supporting information for more detail). SMOOThuman skin software can be made available upon request. Salivary glands of mosquitoes containing GFP-expressing Plasmodium berghei (Pb) sporozoites were incubated with Cy5M2 to achieve labelling of sporozoite mitochondria in vitro. Confocal microscopy of salivary sporozoites revealed a single fluorescent spot adjacent to the nucleus, in agreement with the presence of single parasite mitochondrion (Fig. 1A)[32, 33]. The universal applicability of this in vitro labelling technique for sporozoites of different Plasmodium species was demonstrated by labelling murine Plasmodium yoelii (Py) and Pb and human Pf sporozoites (Supporting information; Fig. S2). Cy5M2 uptake by sporozoites was quantified by flow cytometry, which showed a 430-fold increase in median fluorescence intensity (MFI) of Cy5M2 labelled parasites (Cy5M2 MFI of 7493) compared to unlabelled controls (Cy5M2 MFI of 17.5; Fig. 1B). All sporozoites exposed to Cy5M2 showed tracer uptake, however, a small proportion of sporozoites (8.47%) take up Cy5M2 less readily, as reflected by their lower mean fluorescent intensity (Fig. 1B). Co-staining with MitoTracker® green confirmed Cy5M2 labelling was restricted to the mitochondrion (Fig. 2A; Supporting information Fig S3). In line with our assumptions that mitochondrial TSPO could be a potential target of Cy5M2, competition with the known TSPO inhibitor PK11195 reduced the mitochondrial uptake in a breast cancer cell line (X4-cells), schwannoma cell line (RT4-D6P2T; Supporting information; Fig S4) as well as directly in Pb sporozoites (Fig. 2B). Infected mosquitoes containing salivary gland sporozoites were exposed to Cy5M2 by membrane feeding. As a result of the tracer's molecular size (383,25 Mw) it rapidly diffused through the mosquito to label sporozoites within salivary glands (Fig. 3). In order to study the tracer distribution throughout highly auto fluorescent mosquitoes, we collected midguts and salivary glands of Cy5M2 fed mosquitoes and imaged those organs separately. This indicated universal staining of mosquito organs, including the salivary glands and gland residing sporozoites (Fig. 3, Supporting information; Fig. S5). 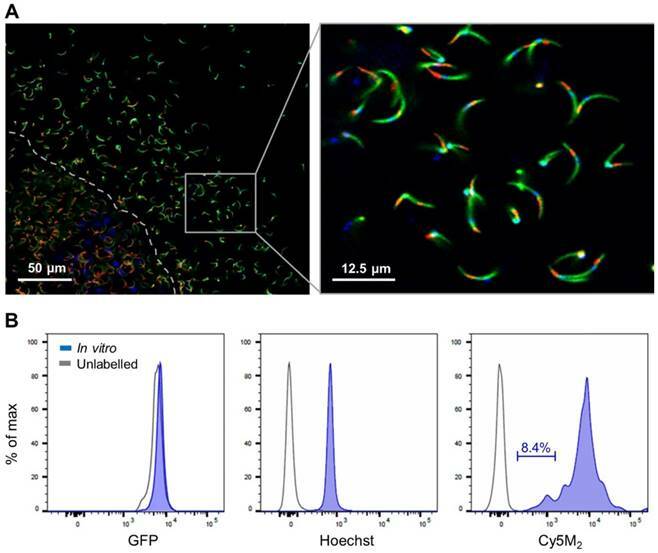 Quantification of the in vivo tracer uptake in sporozoites by flow cytometry revealed clear fluorescence uptake by 92% of sporozoites and a 30-fold increase of Cy5M2 MFI compared to unlabelled control sporozoites (Fig. 3B; Cy5M2 MFI of labelled sporozoites was 515 compared to 17.5 of unlabelled controls). The fitness of Cy5M2 labelled sporozoites was first analysed by determination of in vitro infectivity of mCherry-expressing Pb sporozoites to human Huh7 hepatoma cells. As Cy5M2 is lost during liver stage development of parasites, we detected fully mature liver stages using mCherry expression at 44 hours after infection. Figure 4A shows a liver schizont, demonstrating that labelled sporozoites are able to infect hepatocytes and develop into mature forms. Quantification of Pb DNA within Huh7 monolayers by reverse transcriptase-polymerase chain reaction (RT-PCR) showed comparable levels of invasion of hepatocytes and development into liver-schizonts in cells infected with labelled versus unlabelled sporozoites (p=0.52); Fig. 4B). Next we analysed sporozoite fitness in vivo by determination of parasite liver loads in mice infected with labelled Pb sporozoites. Parasite liver loads were determined by real-time imaging of luciferase expressing parasites in livers of live mice 44 hours after ID sporozoite injection. 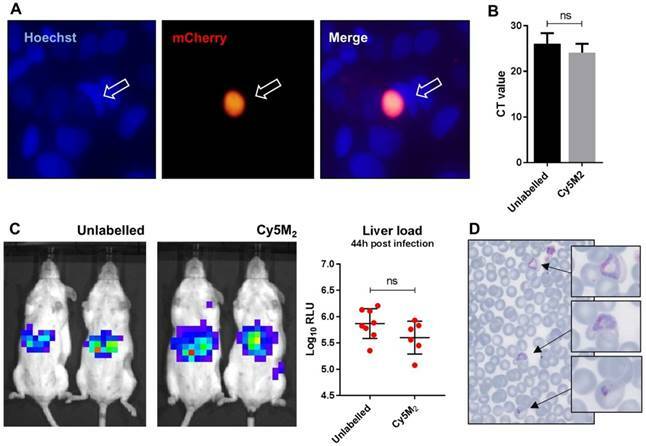 We did not observe a difference in parasite liver load between mice infected with Cy5M2-labeled sporozoites and mice infected with mock stained controls (5.6 ± 0,31 versus 5.7 ± 0,25 mean Log10 relative light units (RLU) respectively, p=0.18; Fig. 4C). We tested Cy5M2 concentrations of 50nM to 2.6uM, which did not affect sporozoite infectivity in HUH7 cells nor in mice (Fig. 4A, Supplementary information; Fig. S6). The ability of Cy5M2-labeled sporozoites to develop into blood stage malaria was demonstrated by positive blood smears at day seven post injection (Fig. 4D) The prepatency of mice infected with Cy5M2 labelled sporozoites was comparable to that of mice infected with unlabelled parasites, both at 6-7 days post infection. Cy5M2 labels sporozoites in vitro. (A) Fluorescence-microscopy analysis of In vitro labelled Pb sporozoites (Bergreen) expressing GFP (green; cytoplasmic) and a single spot Cy5M2 (red). Parasite nuclei are stained with Hoechst (blue). Dotted line demarcates the salivary gland edge, separating expelled sporozoites from gland sporozoites. (B) Quantification of fluorescence by Flow Cytometry. Gray lines represent background signal in unlabelled sporozoites. Blue lines show signal after labelling with Hoechst and Cy5M2. All sporozoites are GFP+. Fluorescence intensity on x-axis, Events normalized using FlowJo algorithms in order to account for the differences in numbers of sporozoites measured per sample (% of max; y-axis). Cy5M2 labels sporozoite mitochondria and can be blocked by TSPO inhibitor PK11195. (A) Double staining of Cy5M2 (red) with Mitotracker® green (green) shows mitochondrial staining in labelled Pb sporozoites. (B) Cy5M2 (red) labelling in mCherry expressing (green) sporozoites can be blocked by addition of the known TSPO inhibitor PK1119. Since the aim of the development of a tracer labelling technique was to realize tracking of individual non-GMO sporozoites in human skin, we studied the migratory behaviour of in vitro Cy5M2-labelled non-GMO Pf sporozoites in human skin by confocal microscopy. (Fig. 5A; Supporting information movie 1). Using our custom analysis tool SMOOThuman skin (Sporozoite Motility Orienting and Organizing Tool) it was possible to isolate individual Pf sporozoites based on their Cy5M2 fluorescent signature, and to record their migration over time. We generated 10 movies during which we were able to visualize 310 individual Cy5M2 labelled non-GMO sporozoite tracks. 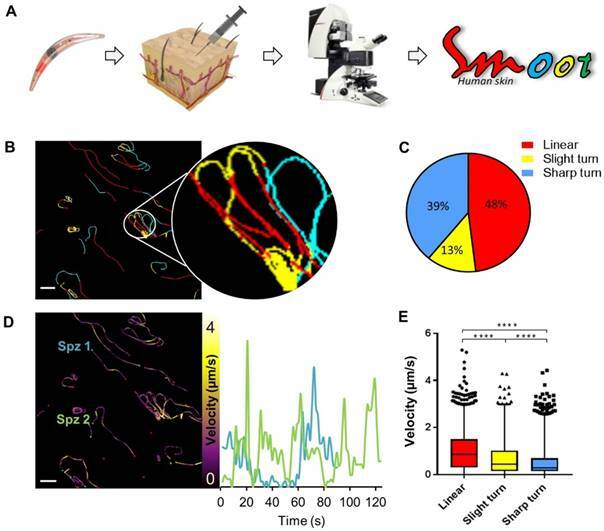 265 of imaged sporozoites were motile (85.5%), and allowed for segmentation of distinct movement patterns: sharp turns (39%), slight turns (13%) and linear movement (48%) (Fig. 5B and C). Additionally, we were able to analyse the velocity of individual sporozoites over the full duration of their tracks (Fig. 5D) or within individual movement pattern (Fig. 5E). The latter revealed that linear segments displayed the highest velocity (median 0.86 µm/s) and velocity decreases with increased turning behaviour (median 0.43 µm/s for slight turn and 0.29 µm/s for sharp turn, p=<0.0001; Fig. 5E). Next to these motility characteristics, SMOOThuman skin extracts parameters of track tortuosity e.g. straightness index and angular dispersion (Supplementary information; Fig. S7). Taken together, these data demonstrate the potential of our custom tracer in imaging and analysing non-GMO sporozoites in human skin. Here we present a novel method to label live sporozoites using a mitochondria targeting labelling technique. This method allowed us to perform molecular imaging of non-GMO Pf in human skin and quantitatively analyse their motility. Uniquely, the Cy5M2 tracer could be universally applied to the Plasmodium species Pb, Py and Pf, and could be utilized to efficiently label sporozoites in vitro or to directly label sporozoites within the salivary glands of live mosquitoes. Subsequently, the labelling approach allowed for cell-tracking of sporozoites. With that, a valuable step has been made towards the realization of Pf sporozoite imaging in human skin. We are convinced the application of the Cy5M2 as a tool for imaging malaria sporozoites is of importance to the development of vaccines consisting of live-attenuated sporozoites. There is a desperate need for tools that help unravel the mechanism of immune protection induced by malaria vaccine candidates. Antibody binding of sporozoites is likely to be an important effector mechanism after immunisation with attenuated sporozoites [8, 34, 35] and results in altered motility of sporozoites under antibody attack [36, 37]. Additionally, the recently EMA-approved malaria vaccine Mosquirix™ targets the highly abundant circumsporozoite protein (CSP) on the outer membrane of sporozoites and is associated with elevated anti-CSP antibody titres [34, 38, 39]. Despite this, the role of anti-CSP antibodies in the overall immune response against malaria remains controversial. For example, it is unknown what the relative contribution of these antibodies is in either blocking sporozoite migration from the skin to the blood or in blocking invasion of hepatocytes [35, 37]. By allowing molecular-imaging based cell-tracking, the sporozoite-tracking technology presented in this study opens up novel possibilities on functional assays that study the effect that anti CSP antibodies (or antibodies against other sporozoite proteins) exert on sporozoite migration in human skin. Such studies may reveal pathways that support the development of new strategies that prevent infection. Feeding infected mosquitoes on blood containing Cy5M2 labels sporozoites. (A) Fluorescence-microscopy analysis showing a whole salivary gland with a cloud of expelled, in vivo Cy5M2 (red) labelled, GFP expressing (green) Pb sporozoites. Nuclei are stained with Hoechst (blue). Scale bar 100 μM. Below: magnification shows mitochondrial staining. (B) Flow Cytometric quantification shows a 30 fold increase in fluorescence in 92% of mosquito-fed sporozoites (in vivo, red) compared to unlabelled controls (grey line). Highest uptake was seen with in vitro labelled parasites (blue). Fluorescence intensity on x-axis. Events are normalized using FlowJo algorithms in order to account for the differences in numbers of sporozoites measured per sample (% of max; y-axis). Labelled sporozoites retain their infectivity in vitro and in vivo. (A) Human hepatoma (HUH7) cell line infection with in vitro Cy5M2 labelled, mCherry expressing Pb sporozoites shows liver schizont (arrow) formation at 44h post infection. (B) PCR data showing similar levels of HUH7 cell infection with Cy5M2 labelled sporozoites compared to unlabelled controls. (p=0.52) (C) Representative IVIS Lumina image of Swiss mice injected with luciferase expressing sporozoites. Mice injected with in vitro Cy5M2 labelled Pb (right panel) show similar liver load 44h post injection compared to mice injected with mock labelled controls (left panel). Quantification of liver loads in relative light units (RLU), pooled data of two experiments. Eight mice per group. p=0,18 (D) Representative blood smear at day 7 post infection with Cy5M2 labelled Pb shows blood stage malaria. Labelled sporozoites can be tracked in a human skin explant model. (A) Non-GMO Pf sporozoites, in vitro labelled with Cy5M2 are injected into human skin explants. Sliced punch biopsies are imaged using confocal microscopy. 2D video microscopy images are analysed using SMOOThuman skin. (B) Individual sporozoites tracks visualized by migration pattern (linear in red, sharp turn in yellow slight turn in blue) and quantification of patterns (C). Velocity is tracked (D) and quantified (E) over the full duration of the track. ****: p=<0.0001 using one way analysis of variance (ANOVA) test. To utilize molecular imaging to investigate the skin migratory behaviour of Plasmodium sporozoites in humans, a highly expressed biomarker is required that can be targeted with a clinically acceptable tracer design. One of the prominent biomarkers in viable cells is mitochondrial metabolism. Therefore, we explored tho use of the single mitochondrion in sporozoites as molecular target for Plasmodium sporozoite labelling. This targeting was verified through co-localization with MitoTracker® green. A competition assay with the known TSPO inhibitor PK11195 indicated that our mitochondrial dye Cy5M2 targets a Plasmodium ortholog of TSPO. Uniquely, the presence of TSPO has not been previously been annotated in the Plasmodium genome. That said, the presence of TSPO analogues is considered universal in eukaryotic as well as prokaryotic cells [40-42]. It thus seems likely that Plasmodium mitochondria are equipped with a structure resembling mammalian TSPO, or at least a structure that binds similar ligands. This assumption is in line with reports that indicate TSPO inhibition affects blood stages of Plasmodium species in vitro [43, 44]. A wide range of cell permeable small molecule benzodiazepine-, isoquinoline-, and pyrimidine-analogues have been reported to bind to TSPO  and because TSPO is widespread in many cell types across species, some of these compounds have already been successfully translated to molecular imaging applications . The same may become true for Cy5M2, which may also be used to e.g. track different cell types. The Cy5M2 labelling technology enabled us to target more than 90% of all sporozoites within the mosquito and in vitro whereby 100% of all sporozoites were efficiently labelled. In vitro labelling was approximately 15 times more efficient compared to labelling within the mosquito. Flow cytometric analysis of in vitro labelled sporozoites identified only a small percentage (8.47%) of sporozoites exhibiting decreased staining efficiency. 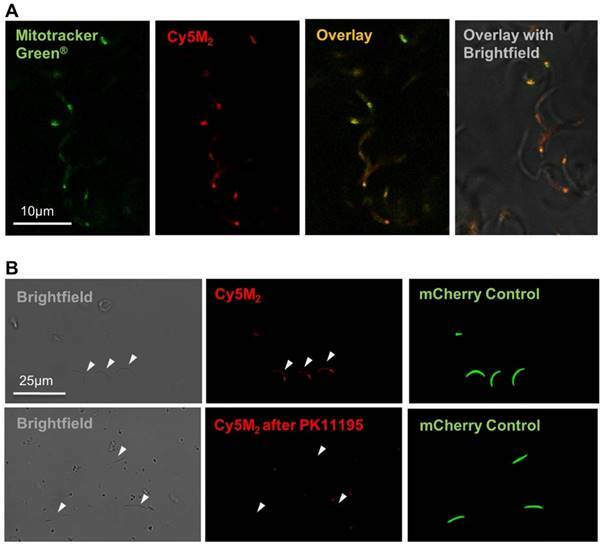 Whether the differences in Cy5M2 staining within sporozoites reflect functional differences for example in infectivity or migrating potential, will be the subject of further studies. Interestingly, the decreased staining efficiency might be the result of different factors, such as the presence of transporters [46-49]. Our fitness assays did not reveal any evidence for toxicity of Cy5M2 to sporozoites at the dose used. When extrapolating the current data for future use of Cy5M2-labelled sporozoites in humans, we expect Cy5M2 toxicity to the human host to be negligible. Reasoning that even if all Cy5M2 is taken up during in vitro labelling of 106 Pf sporozoites (2.6uM in 1 ml), this would result in a total maximum dose of 1ug Cy5M2 or (1pg per sporozoite). At this dose, toxicity assessments of this compound would fall within the tracer dose regime, a property that supports the translational nature of the presented labelling technology [50, 51]. Obviously, when increased understanding of the in human behaviour of Pf sporozoites allows for the doses of attenuated sporozoites to be lowered, overall toxicity risk decreases even further. Our quantitative assessment of migrating Pf sporozoites in human skin underlines the potential of this new cell-tracking technology for imaging of non-GMO Pf sporozoites in the human skin to study factors and mechanisms influencing host-to-host transmission. Using our custom SMOOThuman skin software we were able to extract dermal migration behaviour data from individual non-GMO Pf sporozoites both in detail and over time. Our data show highly directional movement patterns of migrating sporozoites, as well as high velocity variability within sporozoite tracks. Velocity correlated with movement pattern, with parasites slowing down as their tortuosity increased. Variations in velocity and/or movement pattern may correspond with sporozoite interactions with the tissue environment and may therefore indicate sites of particular interest [5, 52]. With the presented technology we have been able to study sporozoite behaviour skin deep. To extend the use of this technology for imaging beyond the skin stage, a matching nuclear medicine based imaging approach, or preferably a hybrid imaging approach will have to be developed . Increased signal intensity per sporozoite through potentiated mitochondrial targeting, may be realized with the use of recent chemical developments in the area of nanotechnology . Such developments will facilitate further use in malaria research, where imaging of small numbers of parasites will help to elucidate the mystery of non-hepatic development of sporozoites and lymph node trafficking, analogous to experiments with Pb in rodents . We have implemented a fluorescence-based molecular imaging approach based on an exogenous fluorescent tracer that allows direct imaging of Plasmodium sporozoites in human tissue. Uniquely, the Cy5M2 labelling approach is a universally applicable technology which even permits labelling of Plasmodium sporozoites while still residing in the live mosquito host. This initial study demonstrated that this technology has the potential to help unravel the fundamental features of skin migration of malaria parasites in humans. Molecular imaging of sporozoite migration in humans allows investigation of factors and mechanisms influencing host-to-host transmission, knowledge that is essential for further development of highly effective vaccines targeting the sporozoite stage. The research leading to these results has received funding from the European Research Council under the European Union's Seventh Framework Programme (FP7/2007-2013) (2012-306890), a ZONMW VENI grant (016.156.076) financed by the Netherlands Organisation for Scientific Research (NWO) and a Gisela Thier fellowship of the LUMC. We thank Geert-Jan van Gemert and Prof. dr. Robert Sauerwein for providing NF54 Plasmodium falciparum infected mosquitoes. BW, MO, DS, AB, ML, BF, SC and CK performed the experiments. BW, MO, CK, CJ, FvL and MR interpreted the data. BW, FvL and MR drafted the manuscript. All authors reviewed and contributed to finalizing the manuscript. The use of human skin explants (obtained as waste material after abdominal reduction surgery) for this research was approved by the Commission Medical Ethics (CME) of the LUMC, Leiden. Approval number CME: B18-009. Corresponding author: M. Roestenberg, Leiden University Medical Center (LUMC), department of Parasitology and Infectious Diseases, Albinusdreef 2, 2333 ZA Leiden, The Netherlands; Tel: + 31 71 5264400; Fax: + 31 71 5266907; email: m.roestenbergnl.